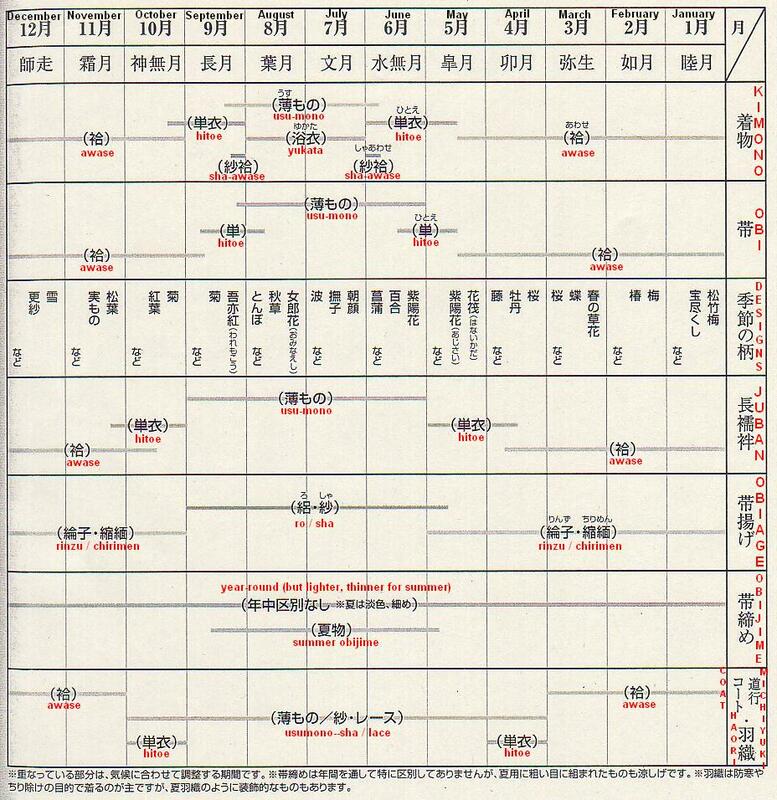 So a certain wonderful someone sent me the Summer 2009 edition of Utsukushii Kimono, and I thought I'd share the amazing super-detailed summer weave usage chart found inside. Prepare yourself for a million usumono terms! Here be a ~10Kb version for modem users. 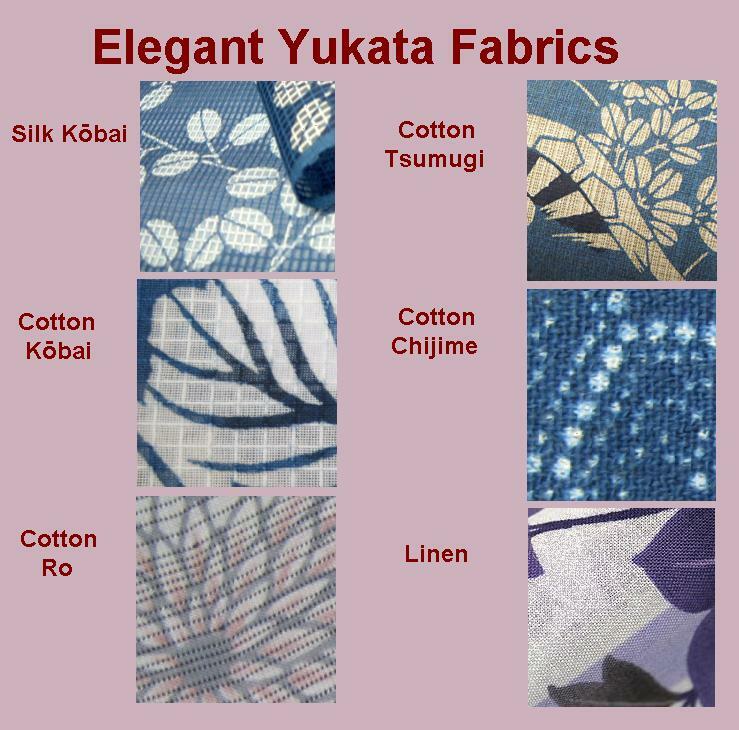 I found a lovely picture that shows some fabric types! Click to see. Asa - hemp. Also used for many other non-silk fibres (linen, flaxen) other than wool. Namatsumugi - means "raw tsumugi". A picture I found. It looks like rough tsumugi. Ra - a kind of mesh. As far as I know, it looks like "silk kôbai" in the picture linked to above, but patterns are sewn on like in embroidery. A picture is posted below. Ro tsuzure - it seems to be a kind of non-fancy weave (click for picture or "tsuzure"). Again, with tiny holes. Sha - like ro (with tiny holes in the fabric) but the pattern is like a grid. 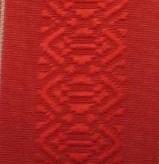 Sha kenjô - it seems to be a kind of weaving used in hakataorimono, where the pattern is formed by weft that is left unwoven for certain lengths. With tiny holes. Pictures of: ro, ro tsuzure, sha, sha tsumugi, ra, sha kenjô, asa, ro shioze. But I have already found out that I can wear my pretty asa obi all the way through the end of September (which I didn't know). On the subject of summer fabrics - I have a kimono that is clearly meant for summer, but is a sort of fabric I have never seen before. It has a dark colored "base" weave, and then certain parts have a light colored weave. This makes for a kimono that looks like it is gray with a dark design, but the gray parts are opaque and the dark parts are sheer and see-through. Does anyone know what this is called? Is that sukashi, Yohmama? I have seen some sukashi haori that sound like your description. I don't know what sukashi is, rubyminky. It reminds me of a fabric we call "burn-out velvet", except that the solid parts are not velvet, but a flat weave. Peccantis, that is the best summer wear chart I've seen - many thanks! I must go through the list of fabrics and see what I don't have already... some additions to my wish list will be inevitable...! Re sukashi, doesn't that have more of a lacy look? The kind of fabric described would be devore (sorry, I can't type the accent here), whether velvet or a non-pile fabric. I think it is made by burning out one fibre against another - for devore velvet, isn't one fibre silk (i.e. an animal protein fibre) and the other either a plant fibre or a synthetic (depending on what is used to burn out the design)? DIY instructions here. Kokoro - usu mono kimono - fading out thing? Is that ro I'm guessing? Maybe just any form of sheer kimono? Usumono referes to special fabrics worn in the hottest time of the year like ro, sha, hemp etc.